The IRMACS Centre Welcomes Quinson Elementary School from Prince George, B.C. Recently, we attended a full-day workshop with Veselin to learn about the Mathcatcher program. We come from a school with 56% of our students self-identifying as being of Aboriginal ancestry. I found the information presented useful on many levels. The statistics on Aboriginal people in Canada was a great introduction to the reason that this work needs to be done in our schools. I was impressed with the mathematical content within the videos and also the authenticity of the cultural elements. 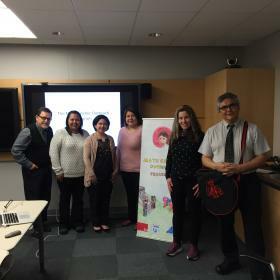 The videos and also the information presented by Dr. Jungic will be used within our school and has transformed our thinking about Math and Aboriginal content. The hands on activities that we were taught and practiced in the workshop, opened us up to possibilities in our own teaching practices. We are taking the information back to our School District and our team is coming up with a plan on how we are going to present this information to our colleagues and have them use the videos in their own practice.